Grandstand Rail Jam in Manchester! 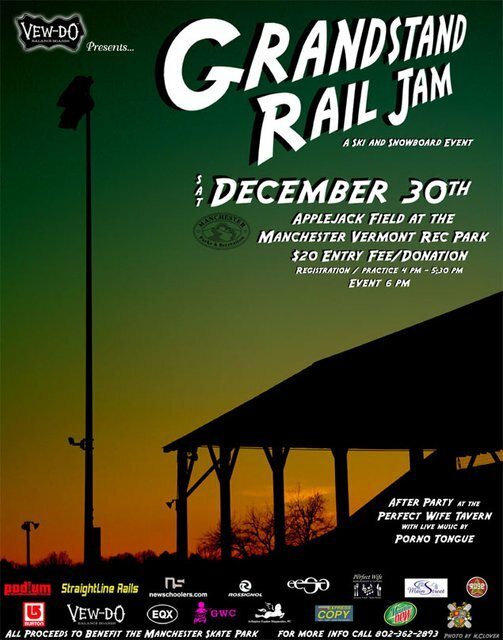 Newschoolers is proud to be a sponsor of the Grandstand Rail Jam going down on Saturday, Dec. 30 at the Manchester, VT Rec Park! This looks like it's going to be the dope shizzle and will be a perfect place for you to dull down the edges on those brand-new skis mom and dad are buying you for Christmas—or, if you didn't get new skis, you can destroy the old ones here and make them get you new ones anyway.There's an entry fee of $20 but don't whine, because all the money is going to buy the Manchester skate park new lights! The event organizers are bringing in lots of snow and some dope rails, yada yada yada, cool prizes, yada yada, stadium lights, yada yada, screaming girls, yada yada, coverage and everlasting fame on NS.com... you get the idea. Be there!